These highlights do not include all the information needed to use VORAXAZE® safely and effectively. See full prescribing information for VORAXAZE®. To report SUSPECTED ADVERSE REACTIONS, call 877-377-3784 or contact FDA at 1-800-FDA-1088 or www.fda.gov/medwatch. VORAXAZE (glucarpidase) is indicated for the treatment of toxic plasma methotrexate concentrations (>1 micromole per liter) in patients with delayed methotrexate clearance due to impaired renal function. 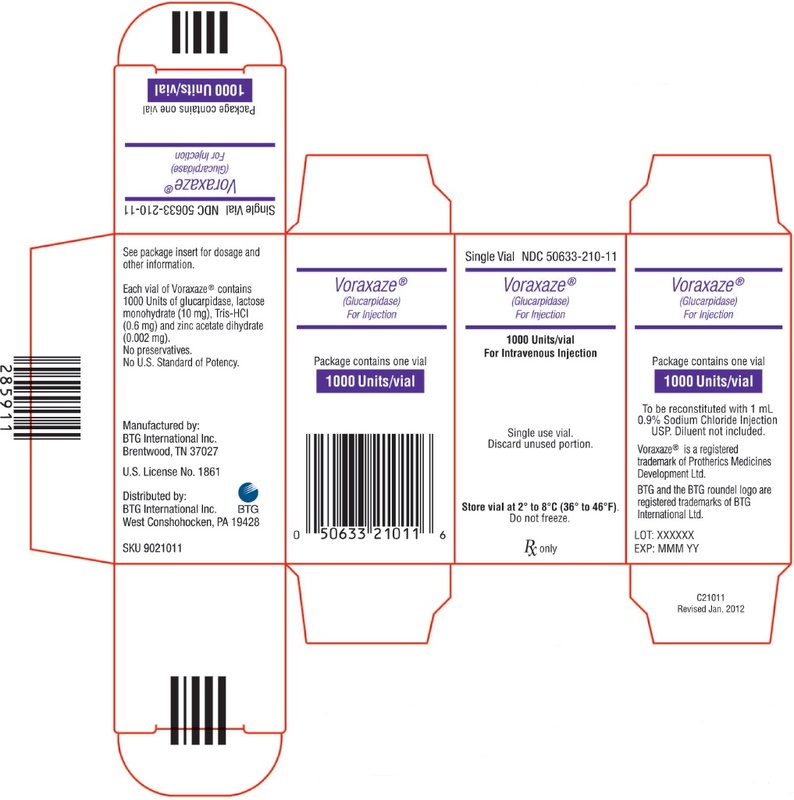 VORAXAZE is not indicated for use in patients who exhibit the expected clearance of methotrexate (plasma methotrexate concentrations within 2 standard deviations of the mean methotrexate excretion curve specific for the dose of methotrexate administered) or those with normal or mildly impaired renal function because of the potential risk of subtherapeutic exposure to methotrexate. Serious allergic reactions occurred in less than 1% of patients [see Adverse Reactions (6.1)]. Methotrexate concentrations within 48 hours following administration of VORAXAZE can only be reliably measured by a chromatographic method. DAMPA (4-deoxy-4-amino-N10-methylpteroic acid) is an inactive metabolite of methotrexate resulting from treatment with VORAXAZE. DAMPA interferes with the measurement of methotrexate concentration using immunoassays resulting in an erroneous measurement which overestimates the methotrexate concentration. Due to the long half-life of DAMPA (t1/2 of approximately 9 hours), measurement of methotrexate using immunoassays is unreliable for samples collected within 48 hours following VORAXAZE administration [see Clinical Pharmacology (12.1)]. Continue to administer leucovorin after VORAXAZE. Do not administer leucovorin within 2 hours before or after a dose of VORAXAZE because leucovorin is a substrate for VORAXAZE [see Drug Interactions (7.1)]. For the first 48 hours after VORAXAZE, administer the same leucovorin dose as given prior to VORAXAZE [see Warnings and Precautions (5.2)]. Beyond 48 hours after VORAXAZE, administer leucovorin based on the measured methotrexate concentration. Do not discontinue therapy with leucovorin based on the determination of a single methotrexate concentration below the leucovorin treatment threshold. Therapy with leucovorin should be continued until the methotrexate concentration has been maintained below the leucovorin treatment threshold for a minimum of 3 days. Continue hydration and alkalinization of the urine as indicated. Serious allergic reactions, including anaphylactic reactions, may occur. The most common adverse reactions (incidence >1%) with VORAXAZE are paraesthesias, flushing, nausea and/or vomiting, hypotension, and headache. Because clinical trials are conducted under controlled but widely varying conditions, adverse reaction rates observed in clinical trials of VORAXAZE cannot be directly compared to rates in the clinical trials of other drugs and may not reflect the rates observed in practice. The evaluation of adverse reactions in patients treated with VORAXAZE is confounded by the population in which it was studied, patients with toxic plasma methotrexate levels due to impaired renal function. Adverse reactions related to toxic methotrexate levels due to prolonged methotrexate clearance include myelosuppression, mucositis, acute hepatitis, and renal dysfunction and failure. The safety of VORAXAZE is based on data from 290 patients who were treated in 2 single-arm, open-label, multicenter trials enrolling patients who had markedly delayed methotrexate clearance secondary to renal dysfunction. Patients with osteosarcoma were eligible for these studies if the plasma methotrexate concentration was greater than 50 μmol/L at 24 hours, greater that 5 μmol/L at 48 hours, or greater than 2 standard deviations above the mean methotrexate elimination curve at least 12 hours after methotrexate administration and there was a 2-fold or greater increase in serum creatinine above baseline. All other patients were eligible for these studies if the plasma methotrexate level was greater than 10 μmol/L more than 42 hours after the start of the methotrexate or the plasma level was greater than 2 standard deviations above the mean methotrexate excretion curve at least 12 hours following methotrexate and the serum creatinine was greater than 1.5 times the upper limit of normal or the creatinine clearance was less than 60 mL/min at least 12 hours following methotrexate administration. Study 1, conducted by the National Cancer Institute (NCI), enrolled 184 patients; safety information is available for 149 patients. VORAXAZE was given at a dose of 50 Units/kg as an intravenous injection over 5 minutes. Patients with pre-VORAXAZE methotrexate concentrations >100 μmol/L were to receive a second dose of VORAXAZE 48 hours after the first dose. The protocol specified that patients continue receiving intravenous hydration, urinary alkalinization and leucovorin, and that leucovorin administration be adjusted to ensure that it was not administered within two hours before or after VORAXAZE. In Study 1, VORAXAZE-related adverse reactions were collected on a flow sheet with a daily log of adverse reactions characterized as "glucarpidase toxicity." Additional safety information was collected from clinical records submitted by treating physicians. This information was abstracted and categorized using the National Cancer Institute (NCI) "Common Terminology Criteria for Adverse Events" (CTCAE) version 3 scale. The Study 1 population enrolled patients with a median age of 18 years (1 month to 85 years); 63% were male, and the underlying malignancies were osteosarcoma/sarcomas in 32%, and leukemia or lymphoma in 63% of patients. One (n=106) or 2 (n= 30) doses of VORAXAZE were administered intravenously; the number of doses was not specified in 13 patients. Doses ranged from 18 to 98 Units/kg, with a median dose of 49 Units/kg. Study 2 is an ongoing expanded access program. At the time of data cut-off, 243 patients were enrolled and safety data was available for 141 patients. VORAXAZE was given at a dose of 50 Units/kg as an intravenous injection over 5 minutes. The criterion for allowing patients to receive a second glucarpidase dose was not specified in the protocol. The protocol specified that patients continue receiving intravenous hydration, urinary alkalinization and leucovorin, and that leucovorin administration be adjusted to ensure that it was not administered within two hours before or after VORAXAZE. Study 2 enrolled patients with a median age of 17 years (6 months to 85 years); 64% were male, and the underlying malignancies were osteogenic sarcoma in 32%, and leukemia or lymphoma in 62% of patients. One (n=122) or 2 (n= 18) doses of VORAXAZE were administered intravenously; the number of doses was not specified for 1 patient. Doses ranged from 6 to 189 Units/kg, with a median dose of 50 Units/kg. In Study 2 only VORAXAZE-related adverse reactions were collected and severity was graded according to NCI CTCAE version 3. Among the 290 patients included in the safety evaluation of VORAXAZE, there were 8 deaths within 30 days of VORAXAZE exposure that were not related to progressive disease. Twenty-one of 290 patients (7%) experienced adverse reactions that were assessed as related to VORAXAZE. Most were Grade 1 or 2 events. One patient experienced related Grade 3 flushing. The most common related adverse reactions that were not hematologic, hepatic or renal events were paresthesia, flushing, and nausea and/or vomiting, which each occurred in 2% of patients (Table 1). 1 This incidence includes the following terms: flushing, feeling hot, burning sensation. 2 One of these reactions was classified as Grade 3 in severity. As with all therapeutic proteins, there is potential for immunogenicity. In clinical trials, 121 patients who received one (n=99), two (n=21), or three (n=1) doses of VORAXAZE were evaluated for anti-glucarpidase antibodies. Twenty-five of these 121 patients (21%) had detectable anti-glucarpidase antibodies following VORAXAZE administration, of which 19 received a single dose of VORAXAZE and 6 received two doses of VORAXAZE. Antibody titers were determined using a bridging enzyme-linked immunosorbent assay (ELISA) for anti-glucarpidase antibodies. Neutralizing antibodies were detected in 11 of the 25 patients who tested positive for anti-glucarpidase binding antibodies. Eight of these 11 patients had received a single dose of VORAXAZE. However, the development of neutralizing antibodies may be underreported due to lack of assay sensitivity. The detection of antibody formation is highly dependent on the sensitivity and specificity of the assay. Additionally, the observed incidence of antibody (including neutralizing antibody) positivity in an assay may be influenced by several factors , including assay methodology, sample handling, timing of sample collection, concomitant medications, and underlying disease. For these reasons, comparison of incidence of antibodies to VORAXAZE with the incidence of antibodies to other products may be misleading. Leucovorin is a substrate for VORAXAZE. Do not administer leucovorin within 2 hours before or after a dose of VORAXAZE. No dose adjustment is recommended for the continuing leucovorin regimen because the leucovorin dose is based on the patient’s pre-VORAXAZE methotrexate concentration [see Warnings and Precautions (5.3) and Clinical Pharmacology (12.3)]. Other potential exogenous substrates of VORAXAZE may include reduced folates and folate antimetabolites. There are no adequate and well controlled studies with VORAXAZE in pregnant women and animal reproduction studies have not been conducted with VORAXAZE. Therefore, it is not known whether VORAXAZE can cause fetal harm when administered to a pregnant woman. VORAXAZE should be given to a pregnant woman only if clearly needed. It is not known if VORAXAZE is excreted in human milk. Because many drugs are excreted in human milk, caution should be exercised when VORAXAZE is administered to a nursing woman. The effectiveness of VORAXAZE in pediatric patients was established in Study 1. Of the 22 patients in the efficacy dataset in Study 1, 12 were pediatric patients with ages ranging from 5 to 16 years. Three of the six pediatric patients with a pre-VORAXAZE methotrexate concentration of 1-50 μmol/L achieved a rapid and sustained clinically important reduction (RSCIR) in plasma methotrexate concentration, while none of the six pediatric patients with a pre-VORAXAZE methotrexate concentration >50 μmol/L achieved a RSCIR [see Clinical Studies (14)]. The pooled clinical safety database for VORAXAZE included data for 147 patients from 1 month up to 17 years of age. No overall differences in safety were observed between these patients and adult patients. Of the total number of 290 patients in clinical studies of VORAXAZE, 15% were 65 and over, while 4% were 75 and over. No overall differences in safety or effectiveness were observed between these patients and younger patients. No dose adjustment of VORAXAZE is recommended for patients with renal impairment [see Clinical Pharmacology (12.3)]. No specific studies of VORAXAZE in patients with hepatic impairment have been conducted. There are no known cases of overdose with VORAXAZE. VORAXAZE (glucarpidase) is a carboxypeptidase produced by recombinant DNA technology in genetically modified Escherichia coli. Glucarpidase is a 390-amino acid homodimer protein with a molecular weight of 83 kDa. Each potency Unit corresponds to the enzymatic cleavage of 1 μmol/L of methotrexate per minute at 37°C. VORAXAZE is supplied as a sterile, preservative-free, white lyophilized powder in single-use vials. Each vial contains 1,000 Units of glucarpidase, lactose monohydrate (10 mg), Tris-HCl (0.6 mg) and zinc acetate dihydrate (0.002 mg). VORAXAZE (glucarpidase) is a recombinant bacterial enzyme that hydrolyzes the carboxyl-terminal glutamate residue from folic acid and classical antifolates such as methotrexate. VORAXAZE converts methotrexate to its inactive metabolites 4-deoxy-4-amino-N10-methylpteroic acid (DAMPA) and glutamate. VORAXAZE provides an alternative non-renal pathway for methotrexate elimination in patients with renal dysfunction during high-dose methotrexate treatment. Plasma methotrexate concentrations within 48 hours following administration of VORAXAZE can only be reliably measured by a chromatographic method because DAMPA interferes with the immunoassays [see Warnings and Precautions (5.2)]. Following administration of VORAXAZE 50 Units/kg to patients in Study 1, methotrexate concentration measured by a chromatographic method was reduced by ≥ 97% within 15 minutes in all 22 treatment-evaluable patients, and was maintained at a > 95% reduction up to 8 days in 20 of the 22 patients [see Clinical Studies (14)]. The pharmacokinetics of glucarpidase in the absence of methotrexate were studied in eight healthy subjects following an intravenous injection of VORAXAZE 50 Units/kg over 5 minutes. Serum glucarpidase activity levels were measured by an enzymatic assay and serum total glucarpidase concentrations were measured by ELISA. Serum glucarpidase activity levels declined with a mean elimination half-life (t1/2) of 5.6 hours. The mean Cmax was 3.3 μg/mL and the mean area under the curve (AUC0-inf) was 23.3 μg•h/mL. The mean systemic clearance (CL) was 7.5 mL/min. The mean volume of distribution (Vd) was 3.6 L, suggesting that glucarpidase distribution is restricted to plasma volume. The pharmacokinetic parameters derived from the serum total glucarpidase concentrations were similar to those generated by serum glucarpidase activity levels except for a longer t1/2 of 9 hours. The pharmacokinetics of glucarpidase in the absence of methotrexate were studied in four subjects with severe renal impairment (creatinine clearance <30 mL/min). Following an intravenous dose of 50 Units/kg of VORAXAZE, the mean pharmacokinetic parameters were similar to those observed in healthy subjects except for a longer t1/2 of 8.2 hours as compared to 5.6 hours in healthy subjects by the enzymatic assay. In a study of cancer patients receiving a high-dose methotrexate (≥1 g/m2) and leucovorin rescue regimen, intravenous administration of 50 Units/kg VORAXAZE 2 hours before leucovorin reduced (6S)-leucovorin AUC0-3h by 33% and Cmax by 52%, and also reduced its active metabolite, (6S)-5-methyltetrahydrofolate, AUC0-3h by 92% and Cmax by 93% [see Drug Interactions (7.1)]. VORAXAZE has not been evaluated in animals for carcinogenic or mutagenic potential or for impairment of fertility. The efficacy of VORAXAZE was evaluated in a subset consisting of 22 treatment-evaluable patients enrolled in Study 1. Study 1 was a single-arm, open-label study in patients who had markedly delayed methotrexate clearance (defined as more than 2 standard deviations greater than the mean excretion curve for methotrexate) secondary to renal dysfunction. All patients received VORAXAZE 50 Units/kg as an intravenous injection over 5 minutes; those patients with pre-VORAXAZE methotrexate concentrations >100 μmol/L were to receive a second dose of VORAXAZE 48 hours after the first dose. The protocol specified that patients continue receiving intravenous hydration, urinary alkalinization and leucovorin, and that leucovorin administration be adjusted to ensure that it was not administered within two hours before or after VORAXAZE. Efficacy was evaluated in a subset of patients enrolled in Study 1 who met the inclusion criteria for the study, had a pre-VORAXAZE methotrexate concentration >1 μmol/L, and had both pre- and post-treatment plasma samples available for determination of methotrexate concentration by a chromatographic method analysis. The main outcome measure was the proportion of patients who achieved a rapid and sustained clinically important reduction (RSCIR) in plasma methotrexate concentration, defined as an attainment of plasma methotrexate concentration ≤1 μmol/L at 15 minutes that was sustained for up to 8 days following the initial injection. Of the 22 patients in the efficacy dataset, the median age was 15.5 years (5 to 84 years); 59% were male, and the most common underlying cancers were osteogenic sarcoma (50%) and leukemia or lymphoma (45%). Ten of the 22 patients achieved RSCIR [45% (95% CI 27, 65%)]. Of the 12 patients who failed to achieve RSCIR, 5 patients (23%) attained a transient plasma methotrexate concentration of ≤ 1 μmol/L. In these 5 patients, the median increase of plasma methotrexate concentration from their nadir was 1.4 μmol/L (0.3 to 2.5 μmol/L). Table 2 summarizes the results of RSCIR and exploratory analyses following the first dose administration of VORAXAZE. An exploratory analysis in subgroups determined by pre-VORAXAZE methotrexate concentration suggests that the likelihood of attaining a RSCIR following the first VORAXAZE injection correlates with the pre-VORAXAZE methotrexate concentration (Table 2). In an additional exploratory analysis, all 9 patients with pre-glucarpidase methotrexate concentrations >50 μmol/L achieved greater than a 95% reduction in methotrexate concentrations for up to 8 days following the initial injection of VORAXAZE although none of them achieved a RSCIR. RSCIR: rapid and sustained clinically important reduction in methotrexate concentration. Six of the seven patients with pre-first dose VORAXAZE methotrexate concentrations >100 μmol/L received a second 50 Units/kg dose of VORAXAZE administered 48 hours after the first dose. Among them, none of the four patients with pre-second dose VORAXAZE methotrexate concentrations >1 μmol/L achieved a RSCIR. The remaining two patients achieved a RSCIR but their pre-second dose VORAXAZE methotrexate concentrations were already ≤1 μmol/L. There are no controlled trials comparing VORAXAZE plus supportive care to supportive care measures alone in patients with toxic plasma methotrexate concentrations due to impaired renal function, therefore there are no data regarding the effect of VORAXAZE on survival or toxic deaths due to methotrexate. VORAXAZE did not prevent fatal methotrexate toxicity in 3% of patients in the safety population. VORAXAZE is supplied as a sterile, preservative-free white lyophilized powder in an individually packaged glass vial closed with a bromo butyl elastomeric stopper and blue flip-off seal. Store VORAXAZE at 36°F to 46°F (2°C to 8°C). Do not freeze. Do not use VORAXAZE after the expiration date on the vial. Inform patients that allergic reactions, including potentially serious reactions, may occur during VORAXAZE treatment. Advise patients to immediately report any signs and symptoms of infusion reactions such as fever, chills, flushing, feeling hot, rash, hives, itching, throat tightness or breathing problems, tingling, numbness, or headache. Inform patients of the importance of continued monitoring of methotrexate blood concentrations and renal status at the appropriate times after discharge from the hospital. VORAXAZE® is a registered trademark of Protherics Medicines Development Ltd.